There are many types of tile currently available on the market. Some of these tiles have a lot to offer, like durability or natural looks. Still, tiles aren’t built to last forever. They can crack, get moldy, stain, chip or flake. For this reason, removing tile can be a tough process. Below is a list of tiles that are the most frequently removed during floor removal services. Ceramic Tile – This tile is one of the most common types removed by our services. 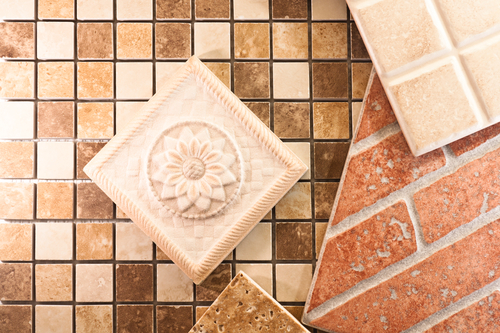 Ceramic tile is a non-metallic material consisting of clay, carbon, silica, and talc. These ingredients are mixed together, heated and left to harden to create tiles. Ceramic can be expensive or inexpensive, depending on whether the tile is glazed or not. If the tile is not glazed, then it would require routine maintenance to prevent staining. Porcelain – Porcelain is a heavy tile made of a clay called kaolin and bone china. This material was first developed in China over two thousand years ago and was later spread to East Asia and Europe. This particular material is popular due to its durability and translucency. It’s easier to maintain than ceramic tile because it’s water and stain resistant. Porcelain can also be made to easily imitate the look of natural stone. Travertine – Travertine is made from limestone. The material is also very durable and low maintenance. Homeowners never need to seal Travertine and it usually keeps its appearance for years. However, there are two main concerns with this type of tile. First, this material is very slippery, which can cause accidents if residents aren’t too careful. Second, this material can be expensive. Slate – Slate tile is exceedingly durable and is used in homes with a lot of foot traffic. It’s beautiful, environmentally friendly and can increase the value of homes. No chemicals are ever used in the process of making these tiles. However, one of the main concerns with slate is that it requires frequent sealing and resealing. If sealing isn’t done properly, the material will sometimes flake off. Saltillo – Saltillo is a form of terracotta tile, which often comes from Mexico. This tile is very inexpensive and easy to obtain. Saltillo is considered environmentally friendly due to the fact that it is made from heated red clay. However, Saltillo tile isn’t very durable and is often uneven because individual tiles are handmade. The material chips and cracks fairly often. Linoleum – This material is the most durable and cost effective on this list. It was designed to resist impacts and cuts and is also very easy to install. The main disadvantage to linoleum is its susceptibility to mold. If the sealing begins to peel, then water can seep into the cracks, causing mold to spread. Linoleum is also prone to yellowing as it ages, meaning that the entire floor would need to be replaced every few years. Marble – Marble is a very expensive type of tile. Of all the tiles on this list, marble is typically regarded as the most beautiful. This material offers a natural look that most stones don’t, including swirls and stripes of color. Marble is also very reflective, typically illuminating rooms with any light that touches it. The main disadvantage of marble is that it isn’t very durable. The material stains, cracks and scratches if not treated with extreme caution. Sadly, chemical cleaning substances can cause the stone to break down. Granite – This stone is very similar to marble. Granite is a rock that forms under intense heat and is characterized as being very dense and durable. However, as time passes, granite is prone to be stained by the grout used to set the stone in place. Limestone – Many people compare the look of limestone to that of wood due to the natural grooves that form on the rock. Limestone requires a large amount of work to maintain. However, if it is done properly the material will last for decades. Otherwise, it can crack, stain and chip. Interestingly, limestone is very popular because it is cold to the touch, so it is ideal for warmer climates. Still, limestone can become slippery when wet, so exercising caution while cleaning is wise. At DustBusters, we provide quality service to efficiently remove all forms of tile, no matter their durability. Customers can trust our business to provide floor removal services that leave your home dust free. If you’re interested in a professional, less expensive, and higher quality floor tile removal, call Dustbusters today at 866-883-8783.